At Lakeshore RV Center, you'll enjoy the nation's lowest prices on top quality RV brands! Our affordable prices, easy financing, and excellent customer service are what makes us the number one Michigan RV dealer! 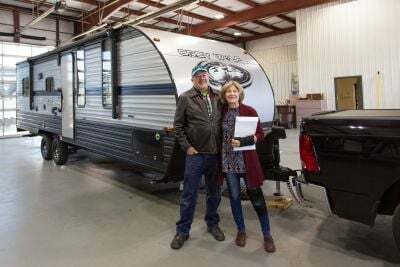 Get ready to start camping with the 2019 Heartland Cyclone 4007! 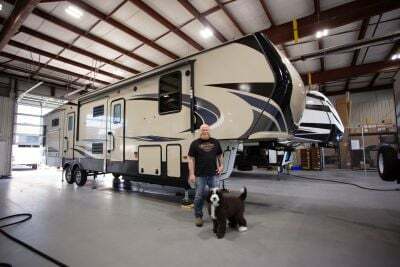 Stop by 4500 E Apple Ave Muskegon Michigan 49442 to bring this incredible 5th Wheel Toy Hauler home! Learn more about this model by calling us at 231-788-2040! Tow with ease with a hitch weight of 3665 lbs. and a dry weight of 16620 lbs. When you're ready to head out on adventures, this rig has a GVWR of 20000 lbs. This family RV will have you traveling the countryside together! So sit back, relax and enjoy the fresh air outside and sit in the shade your 19' 0" awning! Like camping, but hate feeling cramped? You won't feel stuffed inside this roomy RV, which has 2 slides and a width of 8' 5", length of 44' 0", and a height of 13' 3"! Rising or falling temperatures are another thing that you won't have to worry about, as this camper has a 35000 BTU furnace and a 15000 BTU a/c unit! After a full day of outdoor fun, what's better than a great night's sleep? Of course, that's difficult in makeshift beds or in a sleeping bag on the floor. But when you camp in the Heartland Cyclone 4007, you'll sleep in a real, comfy King bed in a handsomely furnished bedroom! It's just one of the many great features of this superlative RV that sleeps 7! The kitchen's 18.00 cu. ft. refrigerator has enough room to store food all vacation long. The 3 burner range cooktop allows you to cook up delicious meals. After a tasty meal with the family, clean dishes with the clean water from the 100 gallon fresh water tank. This 5th Wheel Toy Hauler has all the bathroom conveniences, thanks to its 98 gallon gray water tank and 80 gallon black water tank. Never worry about having enough hot water with 60 lbs. of LP tank capacity. Plenty to save you from making trips to the campground's communal bathroom! The RV bathroom also has a sink vanity, shower, and a Porcelain Foot Flush toilet! You'll have even more campground fun when you bring your toys! Haul them with ease in the 13' 0" garage! This toy hauler has a tough cargo capacity of 3332 lbs. Even when you're hungry or thirsty, you don't need to go inside the RV and leave the excellent weather outside! Make some delicious meals with the outdoor kitchen! This 5th Wheel Toy Hauler has not one, but two bathrooms! The extra half bathroom offers a second Porcelain Foot Flush toilet in the camper! After a long day of outdoor adventures, huddle up with the family around the cozy fireplace! You'll love watching the flickering flames on chilly nights! You'll find so many wonderful sleeping accommodations in this fabulous RV! It has 3 real beds, including the roomy loft built above the living area! Family members or guests will climb up, cozy down, and ease off to dreamland in no time!